It’s been a year and a half since the tragic crash of Gulfstream Aerospace Corp’s G650 test aircraft at Roswell claimed four lives. Ironically, the aircraft recently received its FAA type certificate at almost the exact same time that the National Transportation Safety Board issued their final report on the accident. I’ve been following the online NTSB docket for months — in fact, I’ve read the entire thing. It comprises thousands of pages of interviews, telemetry, analysis, company records, flight test cards, and transcripts. If you’ve got the time and are enough of an airplane nerd to stay awake while reading it, the accident docket provides a fascinating and detailed look into how a modern test flight program is conducted. In their own party submission to the NTSB, Gulfstream agreed that they were ultimately to blame and plainly accepted full responsibility for the accident. However, after reading the collected body of data the NTSB used to reach their decision, I can’t help but wonder if their expectations are realistic. Given the scope and severity of the required tests, it’s surprising that accidents aren’t more common. I’d like to look at a few of the mitigating factors in that regard. First of all, by definition flight test is an inherently risky business. The accident occurred during “single engine continued takeoff” testing, definitely one of the most hazardous parts of the multi-year program. This phase of testing involved continuing a takeoff after an engine fails at the most critical moment. The airplane is aggressively flown to the very edge of its capability while operating with a dead engine. In fact, part of this is referred to as “abused takeoff” testing. They do this over and over again at different weights and CG locations. The crash occurred because the airplane stalled during one of these takeoffs. Gulfstream did not realize how much lower the critical angle-of-attack is in ground effect than it is in free air, and consequently the stall warning devices (stick shaker & pusher) were programmed to activate at too high an AOA. Estimating this “in ground effect (IGE) stall” phenomenon is not an exact science, and it’s easy to see why. New airplanes receive thorough stall testing, but it’s done well away from the ground. It’s impossible to test stall behavior while in ground effect without high risk of destroying the jet, so computer analysis is relied upon instead. It’s also worth noting that while Gulfstream is one of the largest and most successful jet aircraft manufacturers, the G650 was a “clean sheet” design. GAC hadn’t really run a test program of this kind for more than half a century. In the late 1960’s, Grumman — best known for their tough-as-nails military aircraft — was riding high with the success of their business turboprop aircraft, which they called “Gulfstream”. The decision was made to develop a turbojet powered version called the Gulfstream II, and it was that aircraft which introduced swept wings, turbojet powerplants, all new systems, and more. Everything since the G-II has been an incremental development. The G-III was a derivative of that airplane, and Gulfstream IV/450 was a follow on of the G-III. The same is true with the G-V/550. But the G650 was entirely new, and that came with increased risk. Fly-by-wire flight controls, near supersonic speeds, 33% more wing sweep, and so on. For example, Fokker Aerospace developed third-generation fully thermoplastic composite elevators and rudder which are 20% cheaper and 10% lighter than their predecessors. 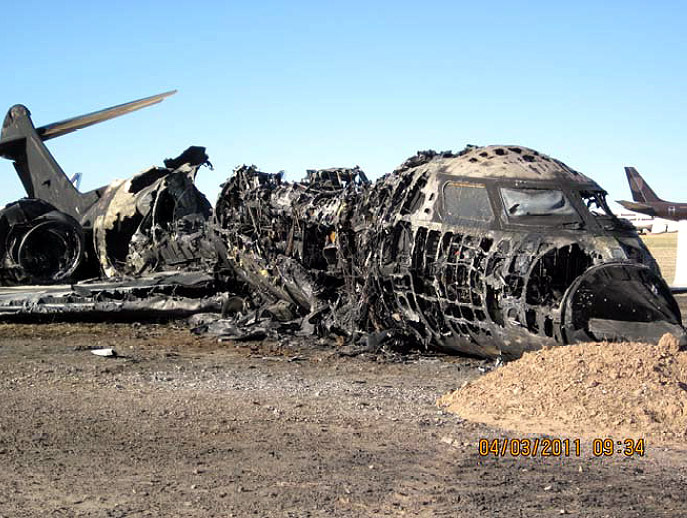 Next, the NTSB took GAC to task for what they characterized as a lack of cooperation with their investigation. A hard drive containing telemetry data was inadvertently discarded, and Gulfstream requested that some information be redacted in the NTSB reports. Naturally, the Feds weren’t happy with any of that. 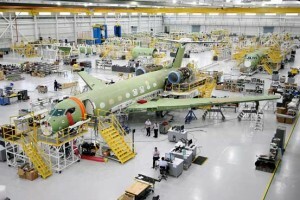 But Gulfstream operates in a very competitive space. It costs billions of dollars to develop a new product, and their aircraft have some unique features that GAC wants to protect: the large signature windows, a wing free of leading edge devices, etc. The design data for their aircraft is closely guarded intellectual property and an important part of the company’s competitive edge. On the other hand, NTSB reports are public information. You can see why Gulfstream would be concerned about what gets published. 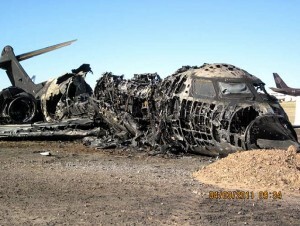 The most interesting finding in the NTSB docket is the revelation that the wing roll-off (stall) which caused this accident was not unique. 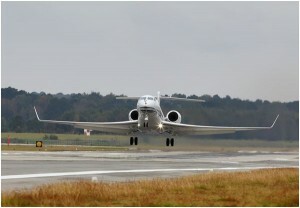 On the G650, two previous roll-offs had been experienced, but when examined by Gulfstream’s flight test department, they were attributed to other causes (piloting technique, for example). Obviously this was a central part of the accident chain and represented the primary missed opportunity to prevent this tragedy. But flight test is a dynamic environment. A post-accident analysis from the safety of a Washington D.C. conference room is quite easy. Coming to the same conclusion from inside an active test program might be more challenging. The on-board crew called the telemetry personnel who told them that the airplane wing tip had struck the ground, and Mr. Johnson responded by telling them that they were going to come back and land. The wingtip had scrapes on it but was otherwise undamaged. Gulfstream personnel from Savannah, including personnel from engineering, flight sciences, and structures, came out to look at the airplane. They did not fly for “a while” and it was concluded that the airplane had pitched up, similar to an accelerated stall, and had reached a stall AOA before the activation of the pusher. It later became known that engineering had not really looked at IGE when designing the GIV wing because they had assumed that the wing was the same as the GIII wing. After the incident, they reviewed the data and determined that the AOA for stick pusher activation should be lowered so that it would activate before IGE stall occurred, in case an abused takeoff, such as applying full aft stick or by pulling too hard, was performed while the airplane was being flown operationally. They began testing with the new stick pusher activation setting after having “sort of” a review in Roswell, with a portion of it being done via conference call with personnel in Savannah. Everyone felt comfortable with the change to the stick pusher system and then they flew again. The change seemed to work, but about a week later Mr. Johnson encountered another stall at a “little higher” altitude, with a wing drop but with no wing tip ground contact. The airplane floated down while it was still in ground effect and they were able to climb by adding power. Mr. Johnson concluded that the change in the pusher setting was not going to work. They then spent a month testing different leading edge stall configurations and became very familiar with the aerodynamics of the stall. They installed vortilons, which worked “real well,” and then performed natural stalls off the coast of Georgia, some as low as 2,500 feet above mean sea level to verify that they had enough margin beyond the stick pusher for anything that could happen IGE. They finished the program, and they did not have another IGE stall, and it worked well for 25 years. His impression was that nobody anticipated that the airplane’s stall characteristics would be that different in ground effect. Mr. Johnson said that, shortly before this interview, he had attended a Society of Experiential Test Pilots symposium where test pilots and engineers said they had not anticipated IGE stall to be a problem in test programs, and that is what happened in the GIV program. The NTSB noted that scheduling pressure was a factor in the accident, but I’m not sure that’s quite accurate. While it’s true that the program was behind schedule, the real challenge for Gulfstream was ensuring the aircraft met the performance goals. Aircraft manufacturers start marketing and sales efforts long before the actual airplane is available to customers, and contracts contain guarantees that the jet will have specific range, airspeed, useful load, and runway performance. If the delivered product falls short, there are financial penalties for the manufacturer. It can sink the whole program, in fact. Aircraft development is like opening a new restaurant: you’ve gotta spend ridiculous sums of money before you see the first dollar of revenue roll in. My friends in the restaurant business tell me it can cost millions. For a company like Gulfstream, development costs are measured in tens of billions. The stakes are high. As it turns out, the G650 met or exceeded all the predicted performance metrics, in some cases by astonishing margins. For example, the airplane was originally designed with a 6,000 nautical mile range, but testing revealed that actual range is 7,000 nm. That makes the 650 competitive with Bombardier models that were predicted to outshine it. 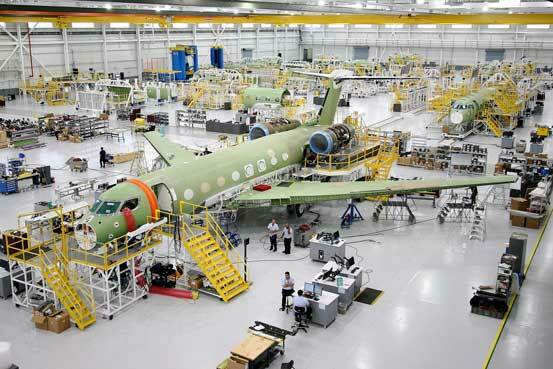 And Gulfstream’s model has come to market years ahead of what is predicted to be its primary competitor, the Global 7000, which won’t enter service until at least 2016. The fastest business jet on the market. From what I’ve been able to gather, the toughest part of the certification process was getting the airplane to meet the runway length requirements set out by Gulfstream. As with most aircraft, the Gulfstream G650 requires more runway to takeoff than it does to land. Oh, it can get off the ground pretty quickly, but runway requirements are not based on how much pavement you need to get into the air. Instead, it’s based on the distance required to accelerate to “decision speed” (the speed above which it is actually safer to continue the takeoff in the event of powerplant failure), and then bring the plane to a full stop. The lower the takeoff speeds are, the less runway is required. The less runway required, the greater the number of airports that will be usable by that aircraft. Unlike your typical airliner, private jets go to some interesting places. High mountain resorts, tiny islands, and thousands of airports around the world which never see any airline service. Nobody wants to spend $65 million on a jet that can’t get in and out of the places they want to go. 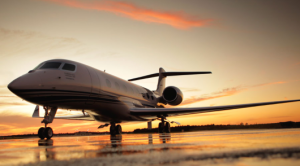 The FAA requires an transport category jet like the G650 to be able to continue a takeoff with an engine out and still achieve specific climb performance. The test pilots on the 650 were required to use a very exacting technique to get the right airspeed, known as “V2”, when they reached 50′ above ground, pulling hard enough to reach altitude and airspeed simultaneously. The transcripts from the NTSB docket show them re-running tests when they were just one knot off the required number, an impressive level of resolution when the aircraft is accelerating so rapidly. The first wing stall the 650 encountered was attributed to pilot technique, and the second to an inoperative yaw damper. The software to electronically limit the AOA was not complete at the time of the test, and probably wouldn’t have helped anyway since everything was calibrated to what Gulfstream estimated the in-ground-effect critical AOA to be. Unfortunately that number was nearly two degrees off. When the airfoil stalls at just over 11˚, a two degree error is huge. An analysis by Gulfstream after the ill-fated Flight 153 revealed an in-ground effect stall could be brought about by an angle of attack as low as 11.2˚ for the accident aircraft conditions, 3.25˚ below the out-of-ground effect stall angle of approximately 14.45˚. At the time of the accident however, the team was assuming a decrement of 1.5˚ for in-ground effect stall, leading to an angle of attack of 12.95˚. The stick shaker was also set to activate at 12.35˚, well above the actual 11.2˚ stall angle. The negative margin between stick shaker and stall meant the pilots received little or no warning of an impending or actual stall. Hindsight is always 20/20, and perhaps Gulfstream really is where the finger should be pointed after this crash. It does seem like the IGE stall issue has been around at Gulftest for a long time. But as I said at the top, flight testing is by definition a hazardous activity. Pushing the envelope with new, high tech designs and building ever faster, larger airplanes in what is undoubtedly one of the most competitive industries will always entail risk. With all that goes into a modern test program, perhaps the biggest surprise is that accidents don’t happen more often. Great post, Ron. A fascinating read. As usual, the NTSB seems on a witch hunt; but, I suppose that is their job. However, based on this summary, I would have much preferred the NTSB to have concluded that this was an unfortunate accident; an rare unaviodable occurence as a result of the inherent risks in advancing the state of the art. I just didn’t see any brain dead screwups one typically finds in nearly all accidents. Yes, that would have been refreshing! I certainly understand and appreciate the NTSB’s deep investigation. They do a tremendous job with it. I only wish their conclusions and recommendations were always as nuanced. It says a lot for GAC that the harshest analysis came from their own party submission. But it also makes sense, because an accident like this is expensive in dollars and blood, and its also bad for business. Fascinating read. Thanks for posting. Gulfstream did not realize how much lower the critical angle-of-attack is in ground effect than it is in free air, and consequently the stall warning devices (stick shaker & pusher) were programmed to activate at too high an AOA. Estimating this “in ground effect (IGE) stall” phenomenon is not an exact science, and it’s easy to see why. New airplanes receive thorough stall testing, but it’s done well away from the ground. It’s impossible to test stall behavior while in ground effect without high risk of destroying the jet, so computer analysis is relied upon instead. This is true for all airplanes. It is the lack of studies and understanding of the ground effect. I, Brian Uitdenbogerd, founder of AirTrain, inc, for more information, http://www.airtrainisthefuture.com. 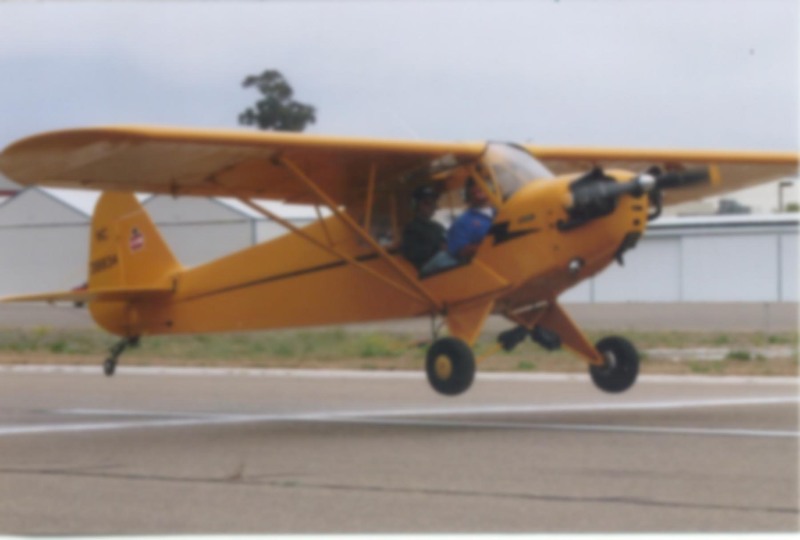 Yes, it is impossible to test stall behavior while in ground effect because if you do without understanding fully, one can face danger rather very quickly. From our studies on ground effect, we are now very comfortable with the information we have to go forward with the building the prototype, AirTrain, the future generation of speed trains, without the rails and wheels because not only we understands the ground effect but more importantly the solutions to avoiding the ground effect accidents. If you are interested on how we can help each other, please contact, Brian Uitdenbogerd, 702 830-0077.